Workers of the drywood termite Cryptotermes domesticus (Isoptera: Kalotermitidae) sitting on softwood from Monterey pine Pinus radiata (Coniferales: Pinaceae) . Termite workers generate vibrations when biting their wood food. The dominant resonant frequency of these vibrations is related to the size of the wood. The termites can perceive these vibration signals and use them to assess the size of the wood. 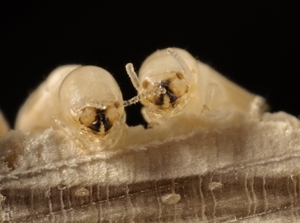 Termites also appear to be able to determine the source of the vibration signals, and use them to make foraging decisions and development and reproduction decisions based on this information.